It can be confusing with Second Life to work out where your parcel ends and where your neighbour’s begins! And, of course, nobody wants virtual neighbourly disputes over prims rezzed on the wrong plot. This tutorial highlights a handy way of monitoring where you parcel and your neighbour’s meet. Some people opt to check out their parcel boundaries by right clicking on their land and going to “About Land,” as this does indeed bring up a temporary yellow line highlighting the boundary. But this is temporary. As soon as you leave the “About Land,” window, the line disappears. 2. Click on ‘property lines’ and you should see a cross appear next to it. As displayed here, pressing Ctrl-Alt-Shift-P will also turn on property lines, as opposed to the long way via the view menu. 3. Your parcel lines are now switched on. If you can’t see them, it might be that they’re under the water, as in the case in this example. The red lines are the boundaries of parcels that DO NOT belong to you. The green lines are parcel boundaries of parcels that DO belong to you. Another way to highlight parcel boundaries and see land you own more easily is by returning to the view menu and going to ‘land owners’. Clicking on this will bring up a cross at the side of it and your new view will look something like this…. The green is land owned by you and the red is land owned by others. To turn off property lines or land owners, simply return to the view menu and click on those options again to uncheck them. 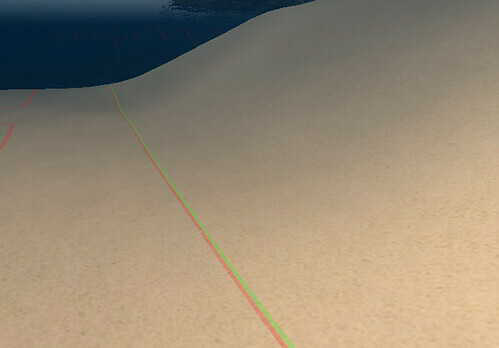 And this is the simplest way to see parcel boundaries on Second Life parcels.